Schematic view of meso-scale AFM 3D probe sensor. 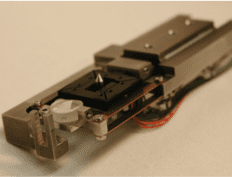 Photo of SFA disk and AFM probe on sliding dovetail mount. The AFM sensor is interchangeable with a SFA disk. 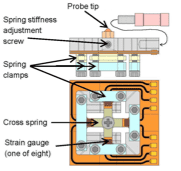 Four vertical wire springs with Strain Gauges on the top of the sensor (not shown) measure the forces in 3 orthogonal directions. A miniature 3D displacement and force sensing device (see figure) has been designed to measure forces in any spatial direction suitable for both Surface Forces Apparatus (SFA) and Atomic Force Microscopy (AFM) measurements in the same experiment. In ‘SFA mode’ the device measures the forces between two macroscopic surfaces; in ‘AFM mode’ it measures the forces and images one of the surfaces with an AFM tip (probe). A prototype device with a meso-scale AFM probe has been described  that has equal sensitivities in all three directions. The choice of using a resistive method for sensing/ detecting force and/or displacement makes this device less sensitive than the beam-bouncing method, but makes it possible to measure forces and displacements in 3D and also to build compact arrays of independent sensors. The device should be suitable for force and structural characterization experiments in the areas of adhesion and colloidal interactions, friction, lubrication and other thin film properties at the macro-, micro- and nano-scales. Relevant references: Kristiansen et al., Langmuir (2008) 24, 1541; Israelachvili et al., Reports on Progress in Physics (2010) 73 1-16. Attachment for electrochemical studies (the EC-SFA). Attachments for measuring and applying forces in 3D (patented). High-speed friction attachment (pin-on-disk type). In situ fluorescence & FRAP measurements (FL-SFA). New fully custom attachment based on your research needs!